Tune in to the Musician’s Show on Wednesday July 12, 2017 from 6-9 PM ET for an interview with John Otten. 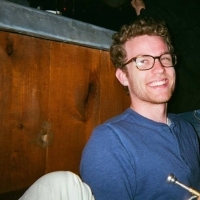 Otten is a New York based trumpeter currently studying at the Manhattan School of Music. He was born and raised in Seattle, a fertile music community. He is an alumni of the Roosevelt High School Jazz Band, which has placed numerous times in the Essentially Ellington Competition and Festival. He was named an Outstanding Soloist three years in a row at this festival as well as a honored member of the 2014 Grammy Camp-Jazz Session big band and the 2013 Jazz Band of America. John has studied with notable jazz veterans such as Jay Thomas, Cuong Vu, Scott Wendholt, and currently with Tony Kadleck. He has also been under the mentorship of Mark Gould, Ingrid Jensen, Marcus Printup, Terell Stafford, and the late, great Laurie Frink. He has performed in clubs in the Seattle and New York City as well as internationally at the Umbria Jazz Festival, Montreux Jazz Festival, and the Jazz À Vienne Festival.